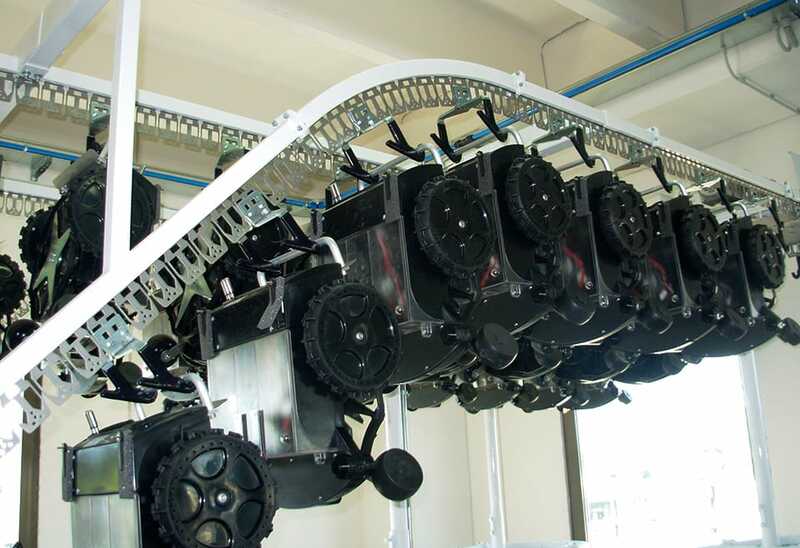 Comet System is the modular and multi-purpose conveyor belt; the system can be used in many different industries and application areas and it comes with a right/left bidirectional control that allows simple manual movement of the belt. The supporting structure consists of a conveyor belt track which, depending on the needs (management, space and organisational), can be fitted with slots or a continuous band made of tempered stainless steel. Comet allows transporting objects during the various stages of production (assembly line), logistics and storage aimed at saving time, personnel and space. The main reference markets are footwear, textiles, clothing, leather goods, food, electronics and mechanics. For the stocking of clothing items and accessories in large facilities or crowded events such as theatres, clubs, concerts, fairs and exhibitions. The colour of the mechanical parts can be customised according to specific design requirements. Electronic search via barcode is available, or the simple entering of the box number assigned to the customer. The system ensures optimisation of laundry operations, by speeding up the pick-up, search and delivery of the item to users.